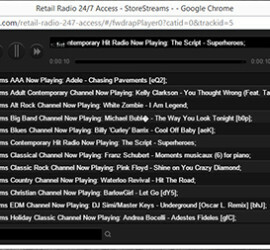 So you signed up for a StoreStreams Retail Radio Account and need to access it for the first time. It’s easy to do just follow the steps below. – Go to StoreStreams.com on your favorite PC, Tablet or Mobile Device that is internet ready and that is streaming media capable. – Once logged in go to the menu bar at the top of the page that says Retail Radio 24/7 look for the drop down menu that say Retail Radio 24/7 Access and click that. Please note to utilize the StoreStreams music service you will need a broadband internet connection.